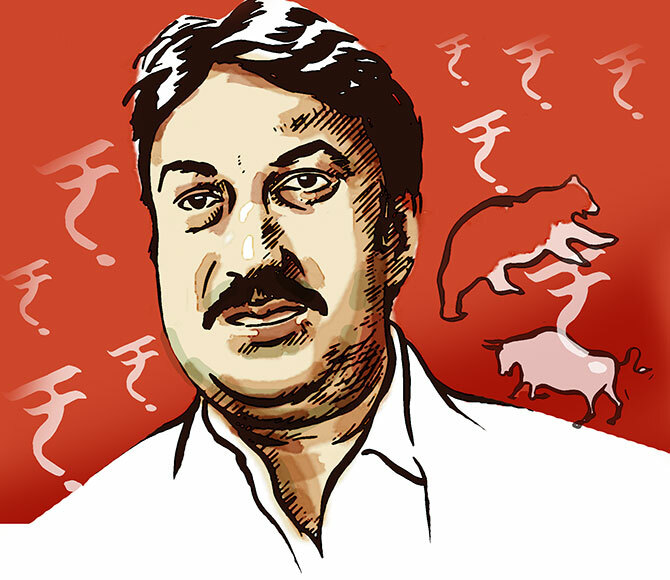 Champion investor Shankar Sharma has always attracted attention for being one of the best-known bears in India's elite investor community. He has bet on making money when markets tumble. He sells today on the hope of buying tomorrow; selling stocks at a higher price and buying the same stocks at lower prices. Quite the opposite of famous Indian investor bulls like Rakesh Jhunjhunwala and Ramesh Damani who opt to buy today to sell tomorrow, buying at lower prices and selling at higher, and have rarely been bearish. Sharma doesn't particularly agree with his bear label. In earlier interviews, he has said it was not an accurate way to describe him considering that he has been bearish just twice in 25 years and said he has made more money out of a bull market, especially recently (as per stats received from his company). Vice-chairman and joint managing director at First Global Pvt Ltd, a Mumbai firm that provides securities brokerage services, Sharma hails from Dhanbad, Jharkhand, where he earned his first dime in stocks. He worked for Citibank after business school (the Asian Institute of Management, Manila), before setting up First Global in 1990 at the age of 26. Sharma discusses demonetisation and the future of the Indian markets in an e-mail interview with Rediff.com's Vaihayasi Pande Daniel. What kind of long-term impact will demonetisation continue to have on our markets and when do you feel our market would recover from it? What is the worst we can see till March 2017 on the Sensex and the Nifty? What is the worst we can see on the rupee over the next six months? The impact on the economy may be different from the markets. Over a 6 to 12 month period, the two will converge, but in the short run, they need not. The way I see it, markets are enjoying a brief relief rally, as is usually the case post any major event of this kind. Corporate results on paper look sort of okay relative to what was expected, but one needs to be careful here: It is our belief that companies have pushed sales without collecting, in order to shore up numbers. The real impact of demonetisation will come in the March results, and that is when the Indian market will start to react. Given that oil looks strong, one can expect the rupee to drift down towards 70. How will India perform this year compared to other emerging markets? I expect India to lag other emerging markets. This is a reversal from our view over the past five years, when I have been bullish India on a relative basis. Commodities are rallying. Oil looks strong, and India's macro looks the weakest of the BRIC pack. All things considered, we expect Russia, Brazil, etc to handily outperform India. What are the best areas to invest in the markets in the next six months, starting now? We have been extremely bullish on Indian small caps for two to three years now, and still remain extremely bullish on this segment of the market. Companies here are showing good earnings growth, and have sharply improved/improving their balance sheets. Given that managements here seem more nimble than many large cap managements, we are very positive on Indian small caps. You have said that demonetisation was a very muddled move from the economic point of view. Why did you say that? And what are the signs, in your view, that have continued to show that you were right in saying that? The economy was tepid even prior to demonetisation. Post that, things have worsened markedly irrespective of whatever data is being trotted out. The informal sector, the rural sector, have been badly hit. Things are unlikely to improve anytime soon. The key question is: Even if over time, people limp back to normalcy... Why did they at all have to suffer and suffer like this? To what end? What was achieved, if anything at all? The verdict is very mixed, both globally and locally, on how Modi will take our country ahead economically. In addition to demonetisation, why else do you feel he is a bad manager economically? India used to be a Third World country, with First World institutions. Now, we are a Third World country with Third World institutions. In this situation, it's best to let such questions pass. It's for voters to decide on this, and since I am not a voter, I don't have to opine on this. How long will it take for India to recover from demonetisation and then what kind of rate of growth will India have? It will take a long time for the effects of demonetisation to wear away, and I am not even sure that a year lost, can at all be even recovered. You are talking people at the margin, being pushed into destitution. Even if they become less destitute after a year, can they become productive enough to add to GDP growth? Are we actually facing a sort of recession? Let me ask a question from the layman's point of view, when can we consumers start spending again, without feeling scared? We are not in recession, but we are in a prolonged period of low growth. Given that monsoons had been good, there was hope that people were going to start spending again. That has been dashed by demonetisation. In my view, one of the biggest policy blunders of this government has been its greed in sequestering the entire gains from the oil price decline and not passing anything to people at all. This has put a brake on spending. For how long will real estate continue to be affected by demonetisation? It was anyway hurting even prior to demonetisation. Post demonetisation, I see almost no chance of real estate reviving. Best to stay away from RE. What kind of year will 2017 be to make money in stocks? If Donald Trump is able to make the right start in strengthening the US economy further, will it reflect in our economy? It's too early to form a view on this. One thing looks certain is that H1B norms will be tightened, and that will be bad news for Indian IT which was anyway hurting because of structural changes in the world of tech. Will the developed markets be able to attract more flows as compared to their emerging market peers over the next six months? This is going to be so, as the US looks strong.